You know that the Sweeney house is a gaming house and that we absolutely love Skylanders (and by we, you know I include myself in that)! My son Liam especially loves playing the game series because he gets an action video game as well as action figure play. It’s the best of both worlds. I mean, we’ve even had a game truck at our house! Well, I have some good news just in time for some last minute Christmas gift shopping. 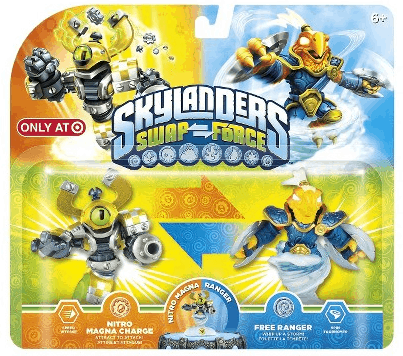 Target Electronics offers the absolute latest in gaming, including this season’s must-have game – Activision’s Skylanders’ Swap Force Starter Pack with TARGET EXCLUSIVE Nitro Magna Charge + Free Ranger two pack!! Thankfully, this pack is compatible for all consoles, including Nintendo Wii U, Xbox One, PlayStation3 (PS3), Xbox 360, Nintendo 3DS, Nintendo Wii, PlayStation 4. You can purchase this two pack ONLY at Target.com or in Target stores, exclusively for only $29.99!! Skylanders’ Swap Force Starter Pack sold separately. For more information on this and everything else Target sells, visit Target on Twitter and Facebook. One (1) lucky Lady and the Blog reader will receive a TARGET EXCLUSIVE Nitro Magna Charge + Free Ranger two pack!! I play video games and I love skylanders. My favorite thing about target is how clean the store is, when other stores are dirty and overcrowded with displays blocking all the aisles so you can’t even push a cart down them target is clean and uncluttered. My boyfriend’s little brother loves to play this game. It is really entertaining. There are just so many things I love about Target, I always spend more than I should there with all there great stuff!!! we all play video games.My favorite thing about Target is they have higher quality merchandise and is a more pleasant store enviroment to shop in. my son loves to play video games and loves skylander! I love shopping at target because of the stacked coupons. My 5 year old has recently started talking about Skylanders but he hasn’t played the game or gotten any of the figures. He does play video games, especially Lego batman and the new super mario brothers. My favorite thing about Target is their wide selection and cute clothes! Oh, and the $1 bins! My son does play games! My kids and grandkids play video games. We haven’t played Skylanders yet. My favorite thing about Target is the unique items and clothing they sell. My children all play video games, mostly Skylanders-they love it! What I love about Target is that they have great sales on video games almost every week and on new releases! My kids love video games. Their favorite is Minecraft. I love shopping at Target because of the awesome items they have and the fact that my Target has a Starbucks! Thanks for the chance to win! Skylanders are my nephew’s favorite video game to play. My son loves Skylanders. I like Target because of the nice clean stores, uncluttered isles and their prices. I’m not much of a gamer, but all my kids, are. My 6 yr old is asking for Swap Force for Christmas, he has Giants and loves it. I like Target for the prices, clean store, and quick checkout. My kids are the video game players-i’m still in the era of Atari with the one joystick and button. No clue on how to use the controllers. I love Target with the internet coupons and 5% back using their credit card. My son likes to play video games. He has been asking for skylanders for awhile now. I think he might get the starter set for Christmas. Target is one of my favorite stores I wish they would build a store closer to where we live! The nearest target is almost 2 hours away! Yes, I like to play video games with my boys! I love to play Skylanders with them. I was actually surprised how fun it was, when my son asked for help him beat Kaos. The thing I love about Target is the $1 section. I love when they put out new stuff…for the new stuff and the great deals on the old! My boys love video games and my youngest LOVES anything Skylander. I have nieces that love playing skylanders. I love targets, cheap prices. My kids love video games but my son can’t get enough Skylanders! My grandkids are new Skylander fans. I love Target online shopping. Skylanders is my son’s favorite – these two are on his list to get! My son is a huge Skylander’s fan and really wants the new game for Christmas! My son plays video games. He just got into Skylanders from playing at his cousin’s house. Santa is bringing him Swap Force. Target is my favorite store. I am in there approx 3-4 times a week. Love it!!! My children love their video games. We play some video games, but don’t have Skl;anders yet. I love that Target is so easy to shop at! Usually everything is in it’s right place. My son loves skylanders. He has all three games. Actually, my boyfriend and I play Skylanders. 🙂 It’s fun! And I like Target because of their big selection – I hate having to go to multiple stores. The whole family plays games and we love skylanders. my son is mostly into lego video games, and my daughters love puzzle games. i love the variety at target, and usually pretty good quality! My daughter loves Skylanders we own the first two and A TON of figures. I do play video games but haven’t tried Skylnders yet. I think Target is great for their prices. We are all big video game lovers in my house! Target here is always clean and have what I need. Yes they play video games and they love Skylanders and I love to shop for clothes at Target! My son is just starting to learn how to play video games. I love Target’s options and variety of products. Also, their prices! Yes, he plays video games and loves Skylanders. I love Target because it’s easy shopping. I’m not a game player….but the kids are. My favorite thing about target is how clean their store is compared to their competitors in my area. My daughter loves video games! Target is the clearance that’s my favorite thing! My son got Skylanders last Christmas and he loves it. We all love to play video games and we love to shop at target because they offer great deals and have everything we want all in one store! My oldest son loves video games and my husband plays them from time to time as well. Target always has fun seasonal items, especially at springtime. All of my girls, their husbands and fiances and my grandson play Skylanders. They all love gaming. Not usually. I like that Target carries a lot of groceries that I like. We like to play family games, mario kart, super mario, guitar hero. Target always has what we need at reasonable prices. And who doesn’t LOVE the clearance.